Vicky Phelan arriving at Government Buildings today. 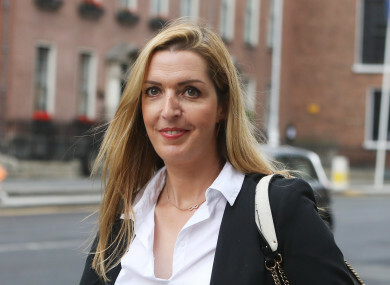 VICKY PHELAN SAYS Taoiseach Leo Varadkar has assured her that women affected by the CervicalCheck controversy will not be forced to go to court for compensation. After meeting the Taoiseach this afternoon, Phelan said in a statement to the media that Varadkar promised her that the state will endeavour to settle all cases through mediation. “Where mediation doesn’t work and labs are contesting an alternative approach will be sculpted out,” Phelan explained. The Limerick woman added that a judge has been approached to work on an alternative approach to what is currently happening in the case of Ruth Morrissey. I have been informed by the Taoiseach that the State Claims Agency has claimed that expert reports for Ruth were not ready and so an offer could not be made. Ruth’s legal team may well dispute these facts but I was very frank and brutally honest with the Taoiseach about how harrowing the courtroom is for women, since I’ve already been through this, and I made it quite clear that I don’t want to see any more women being brought through the courts. In May Phelan called for a public examination of the screening scandal. Speaking to the media today she said that the Taoiseach confirmed that a public commission of inquiry is also his preferred option for investigating the controversy. He said that government and opposition are in agreement and if required legislation will be brought forward to ensure that this is public. Speaking after the meeting the Taoiseach thanked Phelan for taking the time to meet him. “Vicky and all those affected by the CervicalCheck controversy have made a deep impression on the Irish public and on me,” he said. He also reiterated that the Government wants to avoid women and their families having to take the stand. Notwithstanding that parties always retain the right to go to Court, alternative dispute resolution mechanisms must be found which avoid causing unnecessary distress for the women and their loved ones. The Taoiseach also announced that Justice Charles Meenan has been tasked with identifying further mechanisms to avoid adversarial court proceedings for the women and families. Last night Phelan revealed that she is taking a break from campaigning in relation to the CervicalCheck controversy. The scandal came into the public eye in April when Vicky settled a High Court action against the HSE and Clinical Pathology Laboratories (CPL) for €2.5 million over incorrect smear test results from 2011, which failed to show she had cancer. She wrote: “For those of you who are condemning me for ‘bringing down the cervical screening programme’, I never missed a smear and NEVER had an abnormal smear until I was diagnosed in July 2014 with invasive cervical cancer. “I found out THREE years later, in Sept 2017, that a smear from 2011, which was originally read as No Abnormality Detected’ was, when audited, full of CANCER, not precancerous CINI, II or III but Squamous Cell Carcinoma. P8 for the medical heads. IF my smear in 2011 had been CORRECTLY read, I would only have had to have a hysterectomy and would have had a 90% chance of being cured. I will be fighting to stay alive for the rest of my life so forgive me if I am angry and upset and fighting for change. Many people have praised Vicky for her campaigning efforts, and almost €200,000 has been raised to help fund her treatment. Email “Vicky Phelan: Varadkar assured me the State will try to settle CervicalCheck cases out of court”. Feedback on “Vicky Phelan: Varadkar assured me the State will try to settle CervicalCheck cases out of court”.